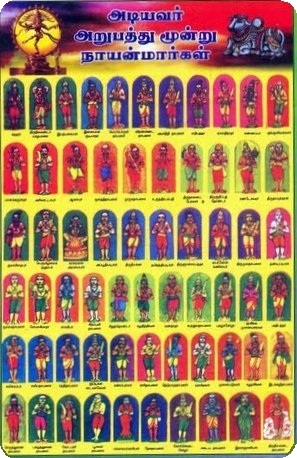 [Samayam (path of realizing self and god), kuravargal - (Guru or Teacher)]: Before we start reading about 'Nayanmars', it becomes important to know about 'Samayakuravargal'. The contribution of these four saivaites are immorable and unmeasurable. They spread the 'Saivisam' and glories of the Lord all over India. They re-established the 'Saivisam' and the truth. 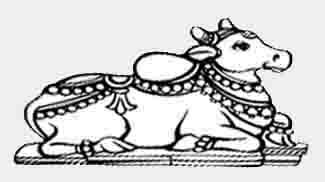 The thamiz land that was excelling in the vaidhIka path and shaiva tradition in the ancient times underwent a dark period during 4,5,6th century ACE, with the invasions from the north that put the budhdhism and more specifically jainism on the royal throne. The art, architecture and lifestyle of the people that kept them as example of civilization diminished because of the self-punishing and colorless religions. The festivals and worship of God full of love that nourished in the minds of people became like fire covered with ash. At this time by the Grace of God came the resurgence of the shaivism in the land of God given thamiz happened with the four pillars raising up the glorious light of shaivism. This was a golden period between 7th and 12th centuries. 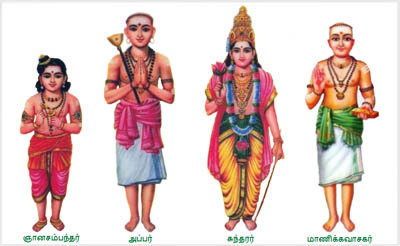 These four traveled through the length and breadth of thamiznAdu kindling the spiritual confidence that the God is not a difficult one and you all can live blissfully and also get supreme liberation, sing, hail, worship our Lord shiva's fame - the truth of the four holy vedhas ! By their tireless effort they brought back the light in the faces of the masses. For bringing about these changes they had to undergo many fatal threats given by the emperors of the land. They were undaunted and roared, "We are slaves only for the Supreme !" The Grace of God acting as the power behind them they won and also brought to their fold the kings who tried to liquidate them. The later two saints kept up the momentum created by the initial two and made the land a real glorious place. The songs of the four gurumAr are very vitalizing and nurture the minds to be a mature loveful and wise abode of the Supreme shiva. The influence they created through their songs stay even now after a millenium and by the Grace of God should continue to inspire the minds of the generations to come. 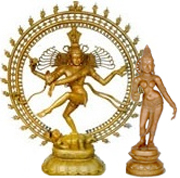 These beacons of shaivism are the guides the shaiva world looks up to and so they are called samayak kuravargaL . The order in which these four great saints are kept is on the account of the order in which they attained the abode of Lord shiva. It may be recalled that day of attaining the abode of Lord shiva is considered much glorious than the day of birth, for example the gurupUjai of the various nAyanmAr. Though sambandhar was born few decades later than appar, he attained mukthi earlier than appar in his young age. So he is first in the order.